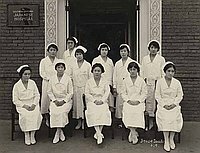 April 11—Discover Nikkei & the Little Tokyo Historical Society present a symposium titled “Japanese Hospital: Caring for the Pre-War Nikkei Community” on Sunday, April 11th, 2010, 2 p.m.- 4 p.m. at National Center for the Preservation of Democracy (111 Central Ave. Los Angeles, California 90012) in Little Tokyo. For the early Issei immigrants, access to medical care was limited. Five Issei doctors sued the State of California after being denied papers of incorporation to build a hospital. Jordan vs. Tashiro was won in the U.S. Supreme Court in 1928. Japanese Hospital opened in Boyle Heights in 1929. As a special guest, the daughter of J. Marion Wright, the attorney who represented the doctors in the court decision in 1928, Janice LaMoree, will speak about her father presenting the case in Washington D.C. As a keynote speaker, Dr. Troy Kaji will talk about the historic case and the establishment of the Japanese Hospital. The moderator will be Gwen Jensen, author of “Silent Scars of Healing Hands”. In addition, video clips from interviews sharing stories related to the community hospitals including Frances Kaji (daughter of Dr. Tashiro), Dr. Sakaye Shigekawa, Dr. Masako Kusayanagi Miura, Yoshiko Inose (daughter-in-law of Inosuke Inose, the president of the Southern California Japanese Hospital), and Margaret Kuroiwa (daughter of Dr. Daishiro Kuroiwa). The sympodium will be held at National Center for the Preservation of Democracy but one needs to check in first at the front desk of Japanese American National Museum (museum admission required) to get a visitor sticker. Free for museum members. Arrive early to view slide show of historic photographs from the hospitals and Little Tokyo community. Light reception to follow. Los Angeles, California 90012) website.